The Sit N Stand Ultra stroller has multiple riding positions, allowing children to sit or stand along the ride, or use an infant car seat in both the front and rear facing seats. The Sit N Stand Ultra stroller can accept one or two infant car seats, all Baby Trend infant car seats, Graco Snugride classic fit, Evenflo Embrace and Discovery, Britax Companion and Chaperone and Safety First On Board 35 Infant car seats to make a travel system for the little one and a ride along for your older child to 50 pounds each child. Folds compactly for easy storage and travel, large storage basket, and foot activated brake. The unique rear facing seat allows your older child to ride or they can easily forward face to stand on the sturdy stand on platform. The child tray conveniently can swing away allowing even older children easy access to the front seat, the parent tray has covered storage with cupholders, with a second child cupholder for your older standing or rear facing child. Some tandem strollers are big, bulky, and hard to fold, but not the Contours Options LT tandem stroller! The new design is lightweight (only 33 ½ lbs.) and folds easily with both seats on for added convenience and easy storage. The reversible seats allow your children to share a tender moment with you, explore their surroundings, or have their own private giggle session. Plus, the Contours Options LT tandem stroller can accommodate an infant car seat. 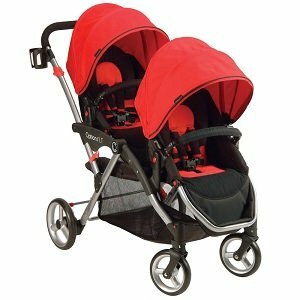 Finally, a lighter double stroller that is easy to use and enjoy! Ready2Grow Click Connect LX Stroller is designed for you to stroll with two children. The cool Glacier fashion is gender-neutral for boys and girls. The Ready2Grow Click Connect LX is Graco’s most versatile double stroller, with 12 riding options. From infant to youth, both of your children will love getting out and about in the Ready2Grow Click Connect LX. The stroller accepts two Graco Click Connect infant car seats and has a bench seat and standing platform for older children. You’ll enjoy years of comfortable strolling—it’s perfect for your growing family! The Face Time rear seat is one of mom’s favorite features—you can position your child to face you while you stroll, for more interaction with him / her. Ready2Grow Click Connect LX is so versatile! 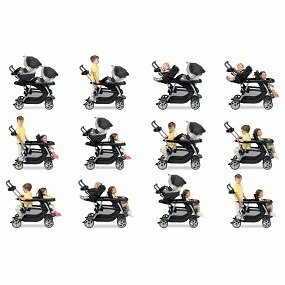 It offers 12 different configurations of riding options, so you can really customize it to stroll with the little ones in your family. 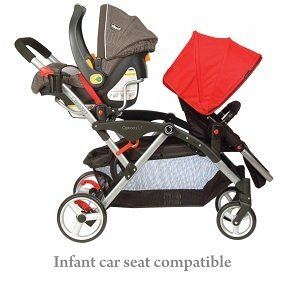 It can accommodate two Graco Click Connect infant car seats, one infant car seat and one baby or toddler, an older child standing on the rear platform with an infant car seat in the front and combinations of all of those. It’s easy to find just the right position for your child to stroll comfortably, thanks to the multi-position reclining front seat—it even lays flat for your baby’s comfort while resting. Your child will also love the head support for an even more comfortable ride. Both seats feature a convertible 3- and 5-point harness, so that you’re confident your little ones are riding buckled in just right. On the upgraded LX version, your little ones will enjoy the soft harness covers for extra comfort. Lockable front swivel wheels with suspension provide superior maneuverability and a smooth ride for those walks with your little ones—whether you’re strolling outdoors or inside. Moms love the extra-large storage basket (perfect to store a diaper bag, snacks and other baby gear) and the parents’ tray with storage and a deep, pivoting cup holder. It’s always convenient to have your essentials close-by. The toddler seat removes for access to the storage basket. The front child’s seat on the Ready2Grow Click Connect LX Stroller features a child’s tray with a cup holder, so that your little one’s drink and snacks are always close-by. Then, the child’s tray conveniently removes so that he or she can get in and out easily. Protective weather visors shield your little ones’ eyes from bright sunlight, which gives you peace of mind that your child is riding comfortably. When you’re looking for a fashion to go with everything, Glacier is just the right choice. 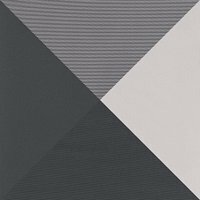 Solid neutrals of black, charcoal grey and pale grey are the perfect combination to keep your little ones riding in style. With 12 riding options, it’s simple to configure this versatile double stroller to suit your growing family’s needs. 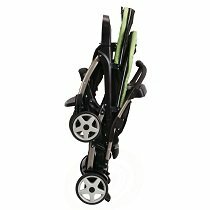 Front stroller seat holds child up to 50 lbs. Rear stroller seat holds child up to 40 lbs. Toddler bench seat & standing platform hold child up to 50lbs. The stroller is designed to accommodate two children for years of use. The front stroller seat holds a child up to 50 lbs., while the rear seat can accommodate a child up to 40 lbs. Then, the toddler bench seat and standing platform hold a child up to 50 lbs. This double stroller is compatible with all Graco Click Connect infant car seats, so you can create a custom travel system. The Ready2Grow Click Connect LX Stroller is compatible with all of Graco’s Click Connect infant car seats, including those in the top-rated SnugRide infant car seat family. The car seats click into the stroller in one simple step, and the clear audio “click” lets you know they’re secure. You can easily create your own travel system to suit your needs. It folds with one hand and is self-standing when folded. The Ready2Grow Click Connect LX Stroller features a super-simple one-hand fold, and it even stands once it’s folded—an added convenience for parents with two babies or children in tow. The rear seat removes for access to the bench seat and standing platform. The rear seat removes for easy access to the bench seat and the standing platform—so that you can accommodate your older child while strolling. The Baby Trend Sit N Stand Double makes traveling with children varying in age fun and easy. Younger child can ride in the front while an older child can sit or stand in the rear. A covered parent tray comes with 2 cup holders, and the one hand fold is fast and easy to use. Safety features include a 5 point child restraint safety harness and a foot activated rear brake. The removable/swing away child tray with cup holder also converts the stroller to a traditional Sit N Stand. This will accept two infant car seats: (for better fit and performance you may need to remove the canopy of the stroller). Baby Trend 22 pounds and 30 pounds, Evenflo Embrace, Discovery, Britax Companion, Chaperone. Recommended use for the front/back seat is to sit upright unassisted up to 40 pounds or 40 inches. The jump seat is recommended for ages 2 1/2 years up to 40 pounds. Comfy adventures for two, plus you! The Graco DuoGlider Classic Connect Stroller has all the essentials a growing family needs. It features stadium-style seating, so the child sitting in the rear is slightly raised for a better view. To keep passengers nice and comfy, both seats feature a reclining seat, child’s tray, rotating canopy and footrest. And for parents, a 1-hand fold, extra-large storage basket, and parent’s tray. The DuoGlider accepts two Graco Classic Connect infant car seats, as well, and holds two children up to 40 pounds each, with comfy, roomy seats for both. The rear seat reclines flat for a young baby’s comfort. When you’re ready to pack up, the DuoGlider’s one-hand, self-standing fold design latches and stows quickly and easily. The Baby Trend Double Jogger in Elixer is a great option for parents who have twins. With the locking front swivel wheel, it makes maneuvering much easier and includes pneumatic bicycle tires. The ratcheting shade canopy provides shade and comfort. A convenient parent tray includes two cup holders and covered storage compartment. The parent tray also includes MP3 speakers plug-in in parent tray, compatible with most MP3 players; and compatible with most Apple iPod models and Apple iPhone. Convenient features also include a large storage basket, multi-position seat recline and quick and easy compact fold. For safety, a 5-point safety harness will keep your child secure while on the go. This product is JPMA certified. It is highly recommended that the children are at least 6 months of age up to 50 pounds or 42″. The perfect option for the active parent. The swiveling front wheel allows you to maneuver in tight corners or through crowds but the option to lock the wheel still allows you to go out and run that 5K with the little ones. The 12″ front & 16″ rear pneumatic air tires and molded rims provide performance and style. Parent tray and dual fin grip cup holders adds convenience. Dual trigger folding mechanism offers uncompromised safety, rubberized grip is comfortable and slip resistant. The city mini GT double takes multi terrain strolling to the next level with all terrain capacities and deluxe standard features in a chic compact package. Its easy to use side by side design and all terrain tires make it perfect for both every day excursions in the urban jungle and weekend adventures off the beaten path. The city mini GT features patented quick fold technology with removable auto lock to keep stroller closed when folded, accessory mounting bracket, a flip flop friendly hand operated parking brake and an adjustable handlebar to accommodate users of all heights. The 8.5″ quick release forever air wheels won’t leave you flat and feature sealed ball bearings, front wheel suspension and dual lockable swivel front wheels for long distance strolling. The supportive plush padded seats recline to a near flat position and feature vented seat tops to increase airflow within the stroller with retractable weather covers to cover the mesh in inclement weather. The city mini GT’s roomy seats also feature a taller seat back and longer foot well to accommodate taller children. Also featured are individually adjustable sun canopies with peek a boo windows, adjustable five point safety harnesses with shoulder pads and buckle cover, a large and easy to access under seat basket, seat back storage compartments and a rear parking brake. The city mini GT double is the next generation in all terrain strolling with all the safety and style you’d expect from Baby Jogger. Maximum weight capacity of the city mini GT double is 100 pounds This stroller is not intended for jogging. The Summit X3 Double offers exceptional performance and maneuverability on any terrain while providing the versatility parents crave in a stroller. This stroller/jogger hybrid is conveniently equipped with an all new remote swivel lock that is mounted on the handlebar. Simple flip the lever to lock the front wheel straight when you’re off for a run or release to swivel mode in one-step for walking, without having to stop the stroller. 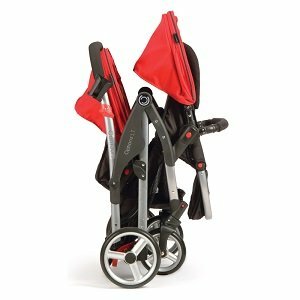 Also featured is Baby Jogger’s patented Quick-Fold Technology so you can fold the Summit X3 Double in one step, the Universal Accessory Mounting Bracket to accessorize with ease, an improved independent all-wheel suspension system and hand operated rear drum brakes that offer increased control on hilly terrain. 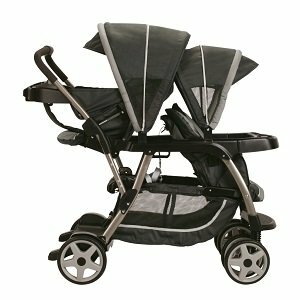 The Summit X3 sports 16″ rear and a 12″ front quick-release pneumatic tires and the padded seat reclines to a near flat position in one step and features a vented seat top with weather cover to increase airflow within the stroller. 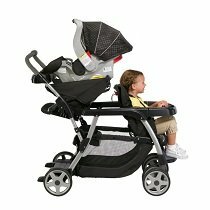 Also featured is a large adjustable sun canopy with peek-a-boo windows and side ventilation panels, an ergonomic handlebar with wipe-clean grip, a seat back storage compartment, a large under seat basket and rear parking brake, while an adjustable five-point safety harness with shoulder pads keep babies safe and comfortable. The Summit X3 is a great solution for parents who want a stroller that does it all while maintaining all the style and safety you’d expect from Baby Jogger. Maximum weight capacity of the stroller is 100 pound.